Out of Africa: did African floral elements disperse into Asia Minor and Europe via the Gomphotherium land bridge? Out of Africa: did plants disperse via the Gomphotherium land bridge? To assess whether plants migrated from Africa into western Eurasia via the famed Gomphotherium land bridge by identifying African floral elements in western Eurasia. To achieve this, key floras across the early to late Miocene in Anatolia, Greece and Central Europe will be investigated. To reconstruct terrestrial environments (vegetation) in Anatolia, Greece and Central Europe that were inhabited by mammals of African origin. To achieve this, evidence from previously studied macrofloras (leaves, fruits, and seeds) will be combined with high taxonomic resolution palynological data obtained during this project. To evaluate whether or not African mammals arriving in Anatolia and Europe during the Miocene occupied new habitats (regarding vegetation units). To achieve this, floras from well documented late Oligocene to middle Miocene sites in Africa north of the equator will be compared to the focal floras from Anatolia, Greece and Central Europe selected for this project..
During the Miocene a land connection between Africa and Eurasia was established as a consequence of the collision of the Afro-Arabian and Eurasian plates. This so-called Gomphotherium land bridge provided an important corridor for mammal migration in the early and middle Miocene, allowing among others various large elephant-like animals to migrate from Africa into Anatolia and the Eastern Mediterranean region and Central Europe. Despite the rich vertebrate fossil records witnessing this large scale migration between Africa and Eurasia there is currently no convincing contemporaneous plant fossil evidence for such a biogeographic pattern. In view of the absence of a broad desert belt (Sahara) in the Miocene and a physical connection between Africa and western Eurasia the working hypotheses of this project is that dispersal of African floral elements into Anatolia and Central Europe should be expected at that time. This project aims to assess whether plants migrated from Africa into western Eurasia via the famed Gomphotherium land bridge. To achieve this, key fossil palynofloras and macrofloras across the early to late Miocene in Anatolia, Greece and Central Europe will be investigated and scrutinized for African floral elements. To accomplish this, evidence from previously studied macrofloras (leaves, fruits, and seeds) will be combined with high taxonomic resolution palynological data from a combined light microscopy and scanning electron microscopy approach used for this project. The combined plant macrofossil records and the palynofloras will make it possible to reconstruct terrestrial environments (vegetation) in Anatolia, Greece and Central Europe that are known to have been inhabited by mammals of African origin during the Miocene. The studied Eurasian floras will also be compared to well-documented late Oligocene to middle Miocene floras in Africa north of the equator to evaluate whether or not African mammals arriving in Anatolia and Europe during the Miocene thrived in habitats (vegetation) different from their original environments. Während des Miozän entstand durch die Kollision der Afro-Arabischen Platte mit der Eurasischen Platte eine Verbindung zwischen Afrika und Eurasien. Die sogenante Gomphotherium Landbrücke eröffnete ab dem frühen bis zum mittleren Miozän einen Korridor als Migrationsroute für Säugetiere. Zum Beispiel wanderten verschiedene große elefantenartige Tiere von Afrika nach Anatolien, in den östlichen Mediterranraum und nach Zentraleuropa. Trotz der vielen Funde von Wirbeltierresten die diese Tatsache bestätigen gibt es aber keine eindeutigen Hinweise ob Pflanzen zur gleichen Zeit diesem biogeographischen Verbreitungmuster folgten. Da im Miozän kein breiter Wüstengürtel (Sahara) und eine Landbrücke zwischen Afrika und Kleinasien vorlagen ergibt sich die Arbeitshypothese dieses Projekts, die Annahme, dass sich afrikanische Florenelemente nördlich des Äquators in gleicher Weise wie Großsäuger über Anatolien nach Zentraleuropa verbreiteten. Das Ziel dieses Projekts liegt darin, festzustellen, ob Pflanzen über die Gomphotherium Landbrücke ebenfalls von Afrika in das westliche Eurasien einwanderten. Um dies feststellen zu können sollen wichtige untermiozäne bis obermiozäne Mikrofloren und Makrofloren aus Anatolien, Griechenland und Zentraleuropa nach möglichen afrikanischen Elemente untersucht werden. Dazu werden schon früher bearbeitete Makrofloren (Blätter, Früchte und Samen) zusammen mit neuen palynologischen Daten (kombinierte LM und REM Untersuchungen) analysiert. Die gewonnenen Daten aus Makrofloren und Mikrofloren sollen ermöglichen die miozänen Lebensräume (Vegetation) die von den afrikanische Säugetieren besiedelt wurden darzustellen. Die untersuchten eurasischen Floren werden darüber hinaus mit gut dokumentierten oberoligozänen bis mittelmiozänen Floren Afrikas nördlich des Äquators verglichen. Dadurch wird es auch möglich darzustellen, in welche Lebensräume, verglichen mit ihren ursprünglichen Habitaten, die neu ankommenden afrikanischen Säugtiere einwanderten. Friðgeir Grímsson, Alexandros Xafis, Frank H. Neumann, Louis Scott, Marion K. Bamford, Reinhard Zetter. 2018. The first Loranthaceae fossils from Africa. Grana 57, 249-259. Friðgeir Grímsson, Guido W. Grimm, Reinhard Zetter. 2018. Evolution of pollen morphology in Loranthaceae. Grana 57, 16-116. Friðgeir Grímsson, Guido W. Grimm, Alastair J. Potts, Reinhard Zetter, Susanne S. Renner. 2018. A Winteraceae pollen tetrad from the early Paleocene of western Greenland, and the fossil record of Winteraceae in Laurasia and Gondwana. Journal of Biogeography 45, 567-581. Friðgeir Grímsson, Alexandros Xafis, Frank H. Neumann, Reinhard Zetter. 2017. 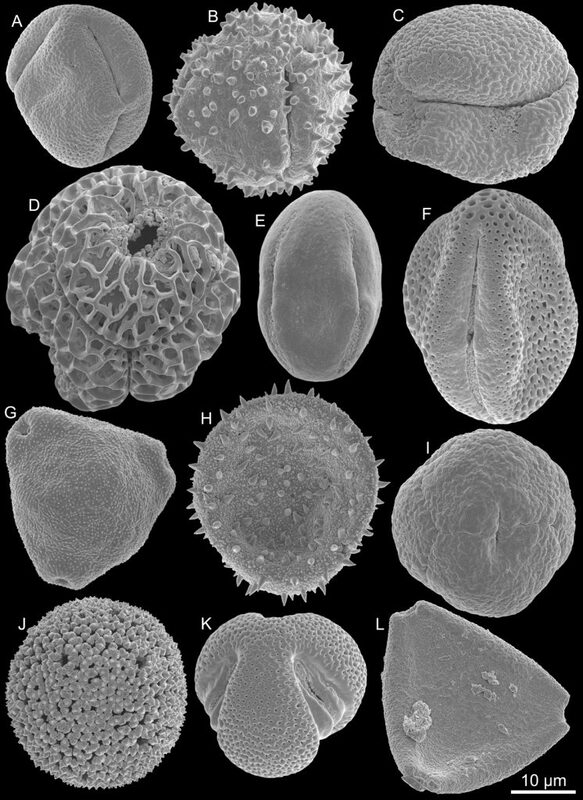 Pollen morphology of extant Winteraceae: a study allowing SEM-based affiliation of its fossil representatives. Acta Palaeobotanica 57, 339-396. Johannes M. Bouchal, Serdar Mayda, Reinhard Zetter, Friðgeir Grímsson, Thomas Denk. 2017. Miocene palynofloras of the Tınaz lignite mine, Muğla, southwest Anatolia: Taxonomy, palaeoecology and local vegetation change. Review of Palaeobotany and Palynology 243, 1-36. Thomas Denk, Dimitrios Velitzelos, Tuncay H. Güner, Johannes M. Bouchal, Friðgeir Grímsson, Guido W. Grimm. 2017. Taxonomy and palaeoecology of two widespread western Eurasian Neogene sclerophyllous oak species: Quercus drymejaUnger and Q. mediterraneaUnger. Review of Palaeobotany and Palynology 241, 98-128. Johannes M. Bouchal, Reinhard Zetter, Friðgeir Grímsson, Thomas Denk. 2016. The middle Miocene palynoflora and palaeoenvironments of Eskihisar (Yatağan basin, south-western Anatolia): a combined LM and SEM investigation. Botanical Journal of the Linnean Society 182, 14-79. Alexandros Xafis, Serdar Mayda, Doris Nagel, Friðgeir Grímsson, Tanju Kaya. 2018. Fossil Giraffidae (Mammalia, Artiodactyla) from the early Turolian of Kavakdere (Central Anatolia, Turkey). 62ndPalaeontological Association Annual Meeting, University of Bristol, UK. Abstract Book, p.114. Reinhard Zetter, Friðgeir Grímsson, Bonnie F. Jacobs. 2018. SEM investigation of the late Oligocene Chilga palynoflora, Ethiopia, East Africa. 10th European Palaeobotany-Palynology Conference. Program & Abstracts, p. 190. Friðgeir Grímsson, Reinhard Zetter, Frank H. Neumann, Louis Scott. 2018. LM vs. SEM based analyses of the early Miocene Saldanha Bay palynoflora Western Cape, South Africa. 10th European Palaeobotany-Palynology Conference. Program & Abstracts, p. 181. Johannes M. Bouchal, Friðgeir Grímsson, Thomas Denk. 2016. Palynostratigraphical correlation of the excavated Miocene lignite seams of the Yatağan basin (Muğla Province, south-western Turkey). EGU General Assembly 2016. Geophysical Research Abstracts Vol. 18, EGU2016-5800. 10/2018 – More is more! A multiproxy approach to Neogene terrestrial ecosystems RCMNS workshop at the Comenius University in Bratislava. Title: Palaeodietary traits of large mammals from the early-middle Miocene of Gračanica (Bugojno Basin), Bosnia-Herzegovina. Speaker: Alexandros Xafis. 10/2018 –The role of NOW in the future of the past. NOW workshop at the Comenius University in Bratislava. Title: On the distribution of Samotherium major: new data from the Turolian of Greece and Turkey. Speaker: Alexandros Xafis. 08/2018–10th European Palaeobotany-Palynology Conference, Dublin, Ireland. Talk in special session 4. Title: SEM investigation of the late Oligocene Chilga palynoflora, Ethiopia, East Africa. Speaker: Reinhard Zetter. 08/2018–10th European Palaeobotany-Palynology Conference, Dublin, Ireland. Talk in special session 4. Title: LM vs. SEM based analyses of the early Miocene Saldanha Bay palynoflora Western Cape, South Africa. Speaker: Friðgeir Grímsson.